Oh! The storyline is great in the preview! 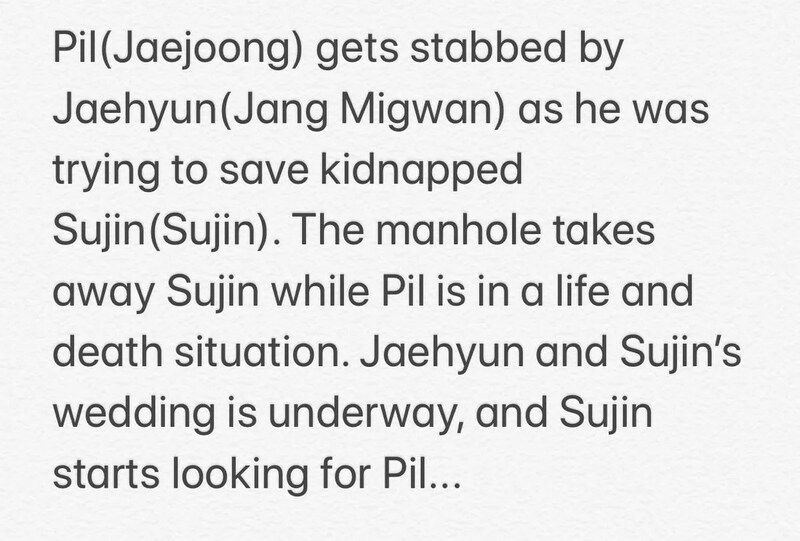 Sujin comes back to the real time with each and every knowledge of what is happening to Jaehyun and Pil, just in time before the marriage. Well at least she would not marry to Jaehyun anymore I think. But how is she going to reunite with Pil? Looking forward so much for tonight’s last episide, while feeling a bit empty to say goodbye to Pil very soon. Pil la, it is so enjoyable with your story around me this summer. Hope you would be with Sujin at the end. Manhole, please help Pil for the last time slip! From the future timeline, they said Pil didn’t attend Soojin’s wedding. I think both Pil and Soojin travel back to the present timeline, maybe Pil is just somewhere in solitude mending his broken heart since it’s Soojin’s wedding day. I’m counting on Jaejoong’s spoiler 😜, hope it wasn’t just a dream. Me too, I have a great time (with all kinds of emotion, from happy to sad) travelling with Pil this past 2 months, I don’t want it to end. Well yes, actually the storyline is not that bad, as commented by other viewers. The clue is embedded here a few episodes earlier, for Pil’s absence in Sujin’s wedding. It is a great clue. Though Pil has been so busy time-traveling here and there for the past 15 episodes, effectively only a week’s time has lapsed. He came back in time, bringing Sujin together, to stop the wedding. Curious if the spaceship living creatures would let Pil know that it is them who have helped him! I agree it is a great story otherwise Jaejoong wouldn’t have chosen it. The problem is the casting. U’s image didn’t quite fit the role. I think if audience can sit a bit quiet to watch the drama (without just flip through the first 1-2 of episodes) , to appreciate Pil’s emotion and character change as the storyline progress, it is not difficult to find that this is in fact a very enjoyable drama to watch. Pil’s character and encounter will bring your emotions up and down, sometimes feeling happy, and sometimes feeling sad for him. But people nowadays have too many dramas to watch. In fact they are just flipping though the drama without appreciating the details. I agree with you.and if you miss or skip an episode you wouldn’t understand how the storyline goes through..although it gives out your rollercoaster of emotion..it’s not sappy that’s why my kid enjoy watching this drama too. yeah a lot of people are saying that this drama is stressful to watch or its not the typical drama they used to watch, but believe me this drama is really good it excites your emotions, you will feel happy, sad, angry, frustrated, annoyed, in love etc. i mean for me as i watch this drama it really frustrate me a lot but what really intrigues me is you keep coming back and watch for the next episode, its like you are annoyed but still want to continue since you invested your emotion in the episode, for me its not really a typical drama because it really shows a situation of our daily life, like its really true that getting work is damn hard, finding love is also another obstacles in life and a lot of things might get in your way for you to be succeed so its just a drama that for me this is how life works, and its really ridiculous that its about time travel but hey….if given a chance i will time travel if that will change my life and if it will makes me a better person like what happen to all the characters….so MANHOLE is not your ordinary time travel drama its a drama that i think everyone needs in times you feel frustrated about life and how you will treasure your life itself.